Well, well… What a week! We’re down to 116 days before this baby is coming out. Yes, it is crazy, I know! 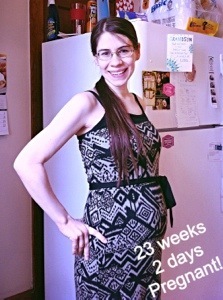 I’m honesty starting to experience a lot of anxiety over the birthing process and of course the lifestyle change. Thankfully for my husband and I it won’t be too different, we’re very blessed to have made adjustments already that will make his/her arrival all the smoother. We still need to purchase a travel system and a couple of knick nacks. All can happen at a later time, but we’re planning on putting up a “mini” registry – for one item, haha. Aka the Paypal donation button. We wanted to do a gift-collaboration idea with anyone who was interested in helping us start out… And the purchase we need the most is the travel system, and being the most expensive, we thought this way friends and family could donate whatever they wanted, small or big. I’ve begun an additional blog here on WordPress: http://knockedupandfit.wordpress.com! This site is mainly used to supporting others in their mental health, writing awareness articles and keeping a tab on my own bipolar disorder during pregnancy. Fitness/Eating well is something I’m very passionate about and I realized it would be more practical to have a separate blog. So, if you like workout plans, weekly diet menus, and anything fitness/beauty style related, be sure to check it out. It’ll probably convert to a fit Mom blog postpartum, and I’d love to follow other mamas who love to exercise. Still pretty stagnant. Baby’s kicks are of course, stronger and more frequent. They also have their own sleeping schedule, which is awesome. Up at 7-8 PM till about 11, then they wind down but it can be off and on movement depending on what I’m doing. This morning I woke up with what I thought was vertigo, or second trimester morning sickness! Needless to say I freaked out a little and ended up phoning my midwife’s office… But it turned out all I needed was a good breakfast and to lie down. Bad depression this week. It lasted for a few days and just would not let up. I felt so worthless, uneducated, cruel, mean, bitter… And of course guilty. Guilt is my trigger. I can’t shake it sometimes, but as I am STILL learning after all these years, that is OK. When I have time to sort my mind through I realize things aren’t so bad and the room lights up and I become productive again. God is good. According to Babycenter.com, the baby will be used to any loud noises that happen already in my daily routine, such as clanking dishes or vacuuming. Which is really mind relieving. Also, their lungs are preparing for breath on the surface. Amazing, but stay in there, please, little baby! And they weigh a little OVER a pound now! Chunky… Just kidding. Will check out that blog! Awesome, thanks! It doesn’t have anything on it yet, but I plan on starting entries as soon as today. That whole thing about them being used to some sounds already is totally true! Gypsy (our dog) will be set off in a frenzy of high pitched barks at the slightest provocation. I was so worried about her bothering Dixie, but she doesn’t even flinch!